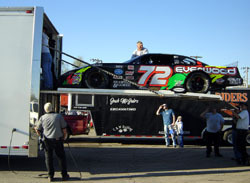 The Show Me the Money 200 had a $10,000-to-win purse, it was the Southern All Stars season opener and the race was scheduled on a weekend when the only other major Super Late Model show down South was a Sunbelt Series race at Bronson . Between the BIR show this past weekend, the Rattler at South Alabama Speedway and the season opener at Montgomery Speedway last month, there were 58 different cars that showed up. However, only eight competitors entered all three events. So it was quite a surprise when only 21 cars signed into the pits. The low car count didn’t hurt the show - about half of the cars that started could have easily won the feature and it only takes two close competitors to make a good race, but it did call into question whether track management at Birmingham International Raceway would be so quick to post a healthy purse for events like this in the future. 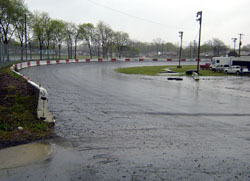 Heavy rain, thunderstorms and even tornado warnings had their effect on the weekend schedule at Birmingham. Originally, qualifying was scheduled for Friday night and the feature was set for an 8 pm start on Saturday night. But when rain washed out the racing card for Friday evening, everything was pushed back one day and the race was moved to Sunday afternoon. This gave teams up to four days at the track with Thursday and Friday (before the rains came) ending up as practice days. Grill ended up finishing ninth after failing to complete the final few laps. The incident with Hamner was not the only excitement that Augie Grill had during the 200-lap race. His #112 was strong all day and it also bounced off the turn four wall one lap after he took over second-place late in the race. Grill had taken over second when John “Boy” Wilkinson got trapped behind the lapped #93 of A.J. Ganino late in the race. Grill had momentum and passed both cars in one maneuver. One lap later, Grill almost nullified his pass by sliding up into the wall by himself. However, he kept on trucking and didn’t even lose a position. Teenager Josh Hamner was the lap record holder in the two-barrel Late Model division at Birmingham up until recently when his record was eclipsed. That meant that he had his eye on the Super Late Model record, a lap dating back to the 2000 that was set by J.R. Norris. The incident started when Hamner slid up the track and into Grill. Grill was disappointed that the incident happened, but was not mad at Hamner for the racing incident. Grill's #112 didn't look so good at the end of the race. commission for the weekend. Nobody was injured though and property damage was very limited. Just four laps from the end of the race, a turn two incident eliminated two drivers from having a chance to catch and possibly beat eventual winner Charlie Bradberry. Two of the quickest drivers of the day, Josh Hamner and Augie Grill made contact battling for second place. Grill was knocked out of the event after slamming the outside wall. 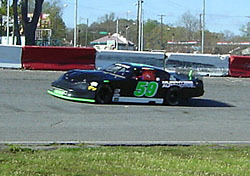 Hamner spun and rejoined the field as the fifth and final car on the lead lap. He clawed his way back to third, but ran out of time to take a shot at Bradberry’s lead. Hamner won the pole for the Show Me the Money 200 with a lap of 19.353 seconds and 116.261 mph. That was more than enough to take over the track record. Norris is almost like an older sibling to Hamner, so the “baby brother” didn’t waste any time calling Norris and rubbing it in. Judging by the tires that he had left on his car, it’s amazing that he even finished at all. Teams were allowed to change four tires during the race and had to replace any flat or cut tires with used tires that had already came off the car. Josh Hamner's team pushes their pole winning car out onto the starting grid. That just left the driver of the #59 wondering what could have been if he had four halfway decent tires at the end of the race. Rain was the big news on Friday. Birmingham wasn’t unfamiliar ground to Schoenfeld either. “We’ve been down here before like six or seven times, so it’s not like it’s our first time,” said Schoenfeld. “We broke an oil line and I think we busted the oil pan,” said Hawkins. And now that Hawkins has raced at Birmingham, he has developed an opinion of the track. However, it might have been tainted by the wreck. “It’s alright, but it’s not one of my favorite tracks right now,” said Hawkins. Not only was the victory at Birmingham the first one of 2005 for Charlie Bradberry, it was also the first time that he has been able to visit victory lane with his new crew chief Ray Jones. Bradberry was generous when it came to giving credit where it was due after the race. About a ten minute driver from Birmingham International Raceway is Hueytown, Alabama. 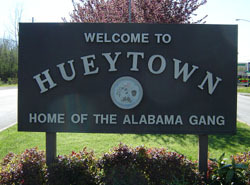 The town is known as the home of the legendary Alabama Gang and is the home of Bobby and Donny Allison, Red Farmer and the late Davey and Clifford Allison, as well as the late Neil Bonnett. “We definitely would have had something for them,” said Wilkinson. Dennis Schoenfeld and his team were a throw back to the old days of racing at Birmingham. They had won the previous weekend in the Big 10 opener at Concord Motorsport Park (NC), so they decided to take a road trip to Birmingham in search of the $10,000 winner’s purse. Schoenfeld ran as high as second place, but got caught in a hard wreck with 50 laps to go. His #43 car was heavily damaged and credited with a finish of 11th. Eddie Mercer earned the outside pole position and also time trialed faster than the previous track record. He led laps in the race and had one of the most consistently fast cars out there, but getting past lap 140 was not going to happen for the Florida driver when a major suspension piece broke on his #72 car. Mercer was able to look on the bright side of things after the race though. “We got out of this place with a racecar, so that’s pretty good,” Mercer said. This was Matt Hawkins third trip to Birmingham with a racecar in tow, but it marked his first start at the 5/8th mile track. Previously, Hawkins came to BIR with a 2 barrel Late Model and the event was rained out. He also was entered in the Early Bird race that was supposed to kick off the 2005 racing season, but got washed out and rescheduled to June 18th instead. Hawkins worked his way into the top five in the second half of the race, but got eliminated with 50 laps to go in the biggest wreck of the day. The wreck caused some messy and race-ending damage to Hawkins’ #22. 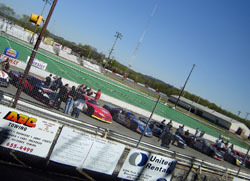 For decades, it was an epicenter of stock car racing and any current NASCAR fan who has not heard of the small town rich with motorsports history should be sat down and told legends aren’t just the name of the cars that their favorite current young gun got their start driving. On the town’s main drag, you will find Neil Bonnett Honda and the auto row on Allison-Bonnett Memorial Drive has ties to the current short track world as well. Super Late Model driver Ken McFarland owns City Auto Sales and Evans Norris Auto Sales is owned by the father of NASCAR Southeast Series standout J.R. Norris. The tires weren't kind to John Boy at BIR. Schoenfeld (#43) runs with the #1 of Keith Cahela. Matt Hawkins was poised to make the biggest move from the start to the finish before he got caught in a wreck.